The California Company runs a manufacturing process to manufacture a main product and a by-product. The total joint production cost for December is $400,000. After split-off point, a cost of $300,000 is incurred to the complete main product and $12,000 to complete the by-product. The final market value of main product is $800,000 and the final market value of by-product is $25,000. There is no beginning and ending inventory for the month of December. The company allocates $2,000 of marketing and administrative expenses to by-product and have a 15% operating profit of the sales price of by-product. Required: How much cost the company should allocate to the by-product. Assume the California Company uses a reversal cost method for its by-product. There were no inventories at the start or end of January. 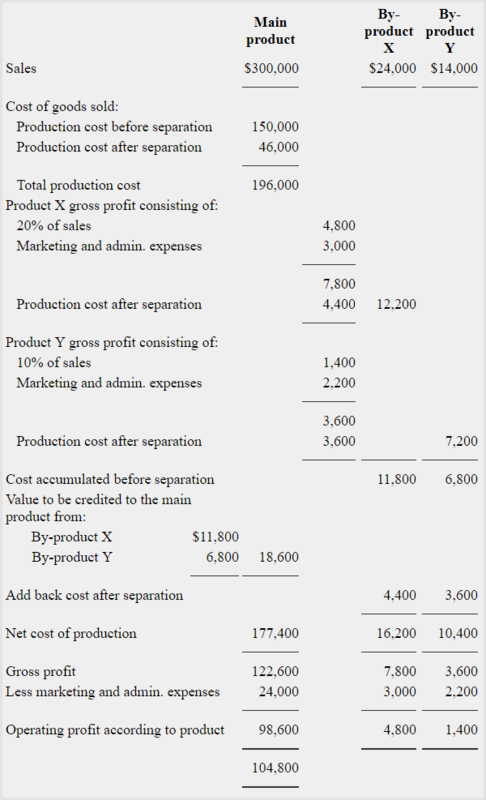 Required: Prepare an income statement using reversal cost method for by-products. Allow a 20% operating profit for by-product X and a 10% operating profit for by-product Y.